Owning a property, especially a dream home, is the desire of many but there are a few important factors to consider before you make the decision. Getting a dream home may be a crucial step to building the family life you desire. Here are some key factors to consider when choosing a home. A key consideration for buying real estate is the location. Although Singapore is a small city, traversing it may take you more than two hours or more. The location of your home does affect your daily commute to the workplace. Therefore, accessibility (or the lack of it) is the main concern for many home buyers. The other factors that influence your home buying decision are the availability of amenities within the vicinity such as schools, markets or parks. Another point to consider is whether you want to buy your dream home from a new launch or the resale market. If you are buying from a new launch, then your choices are rather limited. The next important consideration is your budget. 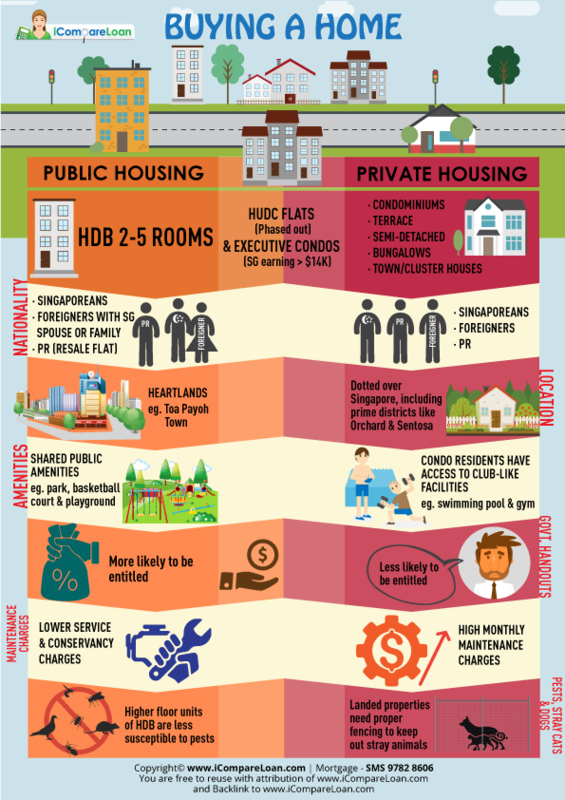 Are you getting a private property or a HDB flat? Other than knowing your eligibility, you have to decipher the pros and cons of the options, checking against your list of needs and wants. The loan amount you need for a private property is almost certainly higher than that of a HDB unit, with a longer loan tenure (maximum 30 years for private housing vs. 25 years for HDB apartments). The loan amount you will be entitled to for your dream home will depend on your income level, age and the level of other assets that you own. If you are looking at public housing, you can avail yourself of the subsidies and grants .There are several government helplines that provide assistance to first-time home buyers. When purchasing a property, you need to take into account some other factors besides the house price. Costs such as the Buyer’s Stamp Duty (which may be a 5-figure sum, depending on your property price) and legal fees (anything from less than S$500 for HDB’s lawyers to over S$5,000 for private property procedures). You will also have to factor in other varying costs, such as renovation, to your budget considerations. For example, if you buy a bare BTO flat or an older unit, your renovation may cost tens of thousands of dollars depending on your personal demands and materials used. There are many loan options available in the market, from HDB (for HDB flats only) to the various banks. When you compare the loan packages, you have to be cognisant of the differences in fees or charges for early repayment, interest rate types (fixed or floating rates), loan-to-value ratio, debt ratio, loan tenure and any package features that could lessen the interest that you will be servicing. You also have to ask yourself how long you expect to be staying in this first home, and its likely appreciation in value. If you have plans to stay in this home for 10 years, and are able to afford higher monthly payments, look for a housing loan of this loan tenure that offers the best deal. What’s next after the purchase of your dream home? While you may be caught up with the initial euphoria of buying your own first dream home , you must not lose sight of other important factors such as how long you intend to stay in the property and will you choose to move out if your family expands. You must ensure that your property is appealing to the prospective buyer and must be kept in good shape and condition. For example, will a unit near to the central business district require extensive renovations or you could utilise the funds to acquire another property. Will future buyers look out for units with extensive renovations? Even the type of home would matter—while a fancy apartment may be perfect for your DINK (that’s “dual income, no kids”) lifestyle, will prospective tenants or buyers be willing to pay a premium for such features? And will a private property give you a better yield when you decide to rent it out later? Do note that upon selling a private property, you will need to wait 30 months before you can apply for an HDB BTO flat (if you are eligible for it). If you are looking for a resale flat as your next home, understand too that you will need to sell off your private property within 6 months of getting a HDB unit. Whether you are buying a property for your own stay or investment, it is a major purchase that merits considerable thought. When you are ready, go own that dream home of yours. It’s a once in a lifetime decision. If you want to buy your dream home but are ensure of funds availability for purchase, our mortgage consultants at iCompareLoan can set you up on a path that can get you a home loan in a quick and seamless manner.